Ever since Rafa Benitez took over as Liverpool manager in 2004 and brought the likes of Xabi Alonso and Luis Garcia with him, there has been a steady stream of Spanish players plying their trade in the Premier League. Whilst Barcelona and Real Madrid caught most attention as Spain enjoyed their golden period that saw them win the 2008 and 2012 Euros, along with the 2010 World Cup, the Premier League also contributed towards those squads. Whilst many of the established names amongst Spain’s glory period are still involved today – the likes of former Premier League stars Xabi Alonso, Fernando Torres and Pepe Reina are no longer involved – the Premier League retains an influence in the Spanish international set up. For varying reasons there have been some notable exclusions from this squad. Santi Cazorla and Juan Mata were a part of the successful Spanish squads, but after a long term injury it is perhaps no surprise that Cazorla is not involved. Mata, on the other hand, is fit but has struggled to reproduce the form he showed in his first two seasons at Chelsea and for both players this probably signals the end of their international careers. Diego Costa is another high profile name to miss out, uncertainties over his fitness levels have cost the Chelsea striker his chance this summer. A few of Costa’s team-mates will be involved though. Defender Cesar Azpilicueta has had a season well below his normally high standards, but is still a key member of the squad and his ability to play either left-back or right-back makes him particularly valuable. Another Stamford Bridge player to have had a below par season is Cesc Fabregas. The enigmatic midfielder was massively influential in his first season at Chelsea, but has struggled to consistently reproduce that form. His talent is without question though and never has been throughout his career. It’s likely that he will be a substitute and be able to offer his quality and ability to change a game late on by opening a team up with his incisive passing. It’s a similar situation with Pedro, who has had a tough period of transition since coming to the Premier League. He is however, another player of unquestionable talent and certainly played his part in the all-conquering Barcelona side under Pep Guardiola. With his pace, technique, movement and composed finishing he gives Vincente Del Bosque another excellent option from the bench to change a game. Staying in London, Arsenal’s Hector Bellerin has had a good season and although he still has some way to go, his pace and attacking threat will always make him an asset. His defending has also improved, but needs to improve further for International football. The injury to Carvajal has given Bellerin the chance to gain the experience of being part of an international squad at a major tournament and if Spain win both their opening games he may be involved in their final group match. It’s early days in his career and he should benefit from the experience. David Silva’s season at Manchester City is another that has been hindered by injuries and he only showed his quality in flashes, but he remains a prominent component in the national team. His fitness issues will mean he’s unlikely to start their opening group game, but that exceptional technique, vision and awareness will surely be called upon. The final Premier League member of Spain’s squad is Manchester United goalkeeper David De Gea, who has made incredible progress over the past 3 years to become arguably the best in the league and certainly amongst the world’s elite in his position. Incredibly though, Del Bosque is reportedly undecided about who will be Spain’s starting keeper for this tournament, with veteran Iker Casillas the other option. The once great Casillas is in the autumn of his career and sadly, as was seen at the 2014 World Cup, is not the player he once was. If De Gea does get the nod, he has shown Premier League fans just how influential he can be, pulling off a multitude of saves to keep a flailing Manchester United side competitive in recent seasons. With defenders as impulsive as Sergio Ramos and Gerard Pique, Spain could well need a top class goalkeeper capable of pulling them out of the mire and De Gea certainly fits that bill. 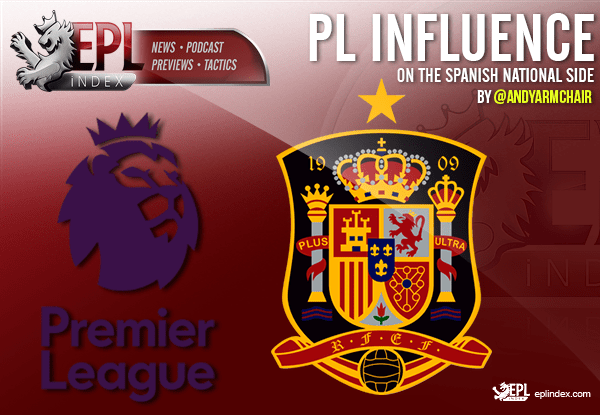 So, although it may be more peripheral in this tournament, the Premier League influence on Spain at Euro 2016 could still be a vital one. Football writer and podcaster. Family man and Liverpool fan. Categories: Arsenal (NN), Chelsea (NN), EPL Index Featured Article, Euro 2016, Manchester City (NN), Manchester Utd (NN), and Spain.' 'Tags: azpilicueta, Bellerin, Carvajal, Casillas, Costa, De Gea, Del Bosque, Fabregas, Guardiola, Juan Mata, Luis Garcia, Pique, rafa benitez, Ramos, Santi Cazorla, Silva, and Xabi Alonso. Where are the Premier League's world class strikers?